In 2012, Donald Trump tweeted that global warming “was created by and for the Chinese in order to make US manufacturing non-competitive”. 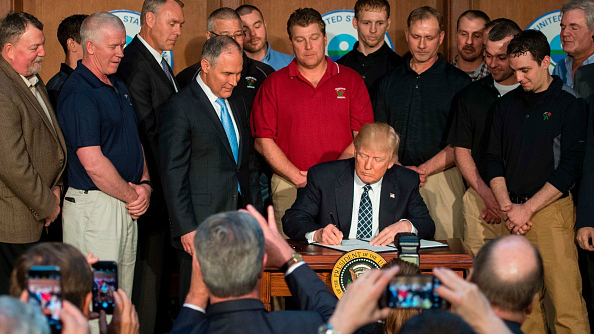 When Mr. Trump won the presidential election last November, environmentalists shuddered. Was a climate change denier about to enter the White House? Decisions taken during Mr. Trump’s first 100 days in office may do irreparable harm to the global climate. The Environmental Protection Agency (EPA) will have its budget cut by 31% in 2018 and its new chief, Scott Pruitt, denies that human activity is a “primary contributor” to global warming. Next on the chopping block could be the landmark Paris Agreement, which Mr. Trump has branded “a bad deal”. Donald Trump the businessman was not always a climate change contrarian. In December 2009, he signed an open letter to the New York Times urging President Barack Obama to take more aggressive action to combat climate change. In 2012, he received nearly $1 million in incentives to make a Trump-branded tower more eco-friendly. “I strongly believe in clean energy, in conserving energy, all of that - more than anybody,” Mr. Trump is quoted as saying about the project. Oil flows through Mr. Trump’s cabinet. Secretary of State Rex Tillerson is the former CEO of ExxonMobil and Commerce Secretary Wilbur Ross holds a majority share in EXCO Resources. In his former role as Oklahoma’s attorney general, EPA chief Scott Pruitt worked hand-in-hand with the fossil fuel industry to obstruct federal regulations. After the election, he adds, Mr. Trump “fell into the lap of the Heritage Foundation”, an ultra-conservative think-tank with extensive ties to the fossil fuel industry. Groups like Heritage allegedly provided several members of the president-elect’s transition team. Myron Ebell of the Competitive Enterprise Institute (CEI), who characterised the green movement as the “greatest threat to freedom” in the US, led the EPA transition team. Those fossil fuel interests, Professor Mann said, have driven a decades-long effort “to manufacture a fake debate about climate change”. From 1998 to 2014, ExxonMobil spent nearly $31 million funding foundations and think-tanks sceptical of climate science and its proponents, according to a Greenpeace investigation. Through organisations like CEI, the fossil fuel industry funded research which flooded the climate debate with doubt. Emissions of common air pollutants dropped 71% from 1970-2015. In this period, US GDP grew 246%. With Mr. Trump in the White House, Dr. Michaels’ prolonged efforts would seem to be succeeding. Yet a recent Gallup poll showed that 45% of Americans now worry “a great deal” about climate change, the highest figure in three decades of polling. Eric Pooley, author of ‘The Climate War’, argues that the influence of climate change sceptics has been “waning for some years”. However, “the political power aligned with the climate deniers” is now peaking. Will coal miners go back to work? Economic realities suggest they are probably not. Although the order ends Mr. Obama’s moratorium on new coal mining leases on federal lands, meaning that older plants marked for closure will stay open longer, coal mines are increasingly mechanised, so there is less demand for labour. “He can’t bring them back,” said Robert Murray, one of America’s biggest coal executives, referring to lost blue-collar jobs. Mr. Trump’s rhetoric has failed to match reality elsewhere. When the controversial Keystone XL pipeline was approved in March, the president hailed “a great day for American jobs". However, the State Department estimates that just 35 permanent employees will be required to maintain the pipeline once it is completed. According to the Pew Research Centre, 65% of Americans prioritise developing alternative energy sources over fossil fuels. If Mr. Trump does not turn out to be “the greatest jobs producer God ever created”, as he predicted on the campaign trail, his willingness to sell environmentalism down the river could hurt him at the ballot box. In any case, America’s checks and balances are providing stern resistance. Soon after Mr. Trump signed his executive order, a coalition of conservationist groups sued the federal government. Sierra Club, one of the plaintiffs, said it would "fight Trump in the courts, in the streets, and at the state and local level across America”. In Congress, Mr. Trump’s budget may not muster enough Republican support to pass. But arguably the most significant development is the groundswell of popular protest which has greeted the Trump presidency, starting the day after the inauguration with the Women’s March, which had a strong environmentalist contingent. ExxonMobil has even written a letter to the White House urging it to keep the US in the Paris Accords. Mr. Trump has been turned once. Could he be turned again?